Starting as a truly footloose industry in 1981 with Tim Green traveling from worksite to worksite by bicycle with all his tools strapped to his back. Wheelfast today is situated in Hanover, Ontario with a state-of-the art retail and wheel-building shoppe. 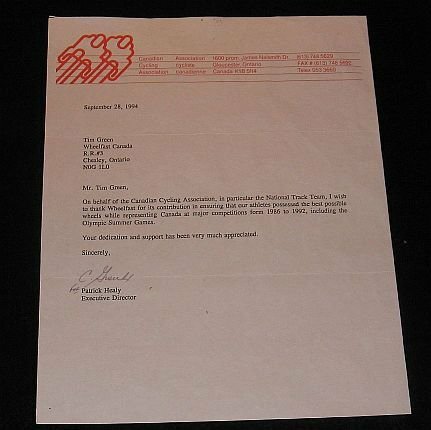 From 1988 to 1996, Wheelfast built and serviced the spoked-wheel products for the Canadian National Track Team. 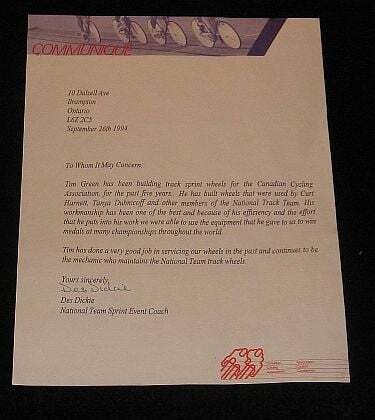 Over the years, Tim Green has built the wheels for such notables as Curt Harnett who one a bronze medal for Canada at the 1992 Olympics in Barcelona, Spain. Wheelfast has also built the wheels for Tanya Dubnicoff, Claire Hughes and John Walton and others on the Canadian National Track Team that have won many championships throughout the world. Joe Zuppanic, one of Canada's top wheelchair athletes used Wheelfast-built wheels in the Paralympic Games in Barcelona Spain in 1992. In 1994, Joe Zuppanic also won a Gold medal with Wheelfast-built wheels in the Ontario Games for the Physically Disabled in Windsor Ontario.